I saw GIRLS LOST when it played NewFest last year. I really liked it. This is the review that I during that festival. 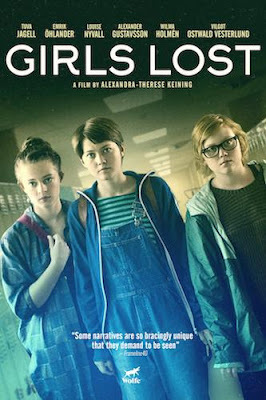 GIRLS LOST is about three young girls who end up being able to become boys, thus setting up all sorts of complications. Working on several different levels this film, based on the award winning novel by Jessica Schiefauer, GIRLS LOST has three put upon girls growing a strange plant who's nectar will turn them into boys until they next fall asleep. Finding a certain amount of freedom the trio find that experiencing life as boys helps them in their regular lives. However complications arise as they fall in with some less savory young men and one of the girls falls for one of the guys while she is in her male identity. A good little film explores not only what its like to be a kid of a certain age but also raises all sorts of issues about gender, sexuality and who we really are inside. The cast of teens is first rate with the three leads completely disappearing into their characters. The film also looks and feels wonderful managing to evoke both the real world as well as one where something magical really could happen. You'll notice that I am not doing a large review of the film and that is intentional. The reason behind this is that seeing the film as part of New Fest the film was saddled with a great deal of baggage concerning the obvious LGBT themes that the film kicks up and I don't think that's entirely fair. Yes the themes and plot threads are there but watching the film it was clear that the film is greater than being just a LGBT film. There is something about the way the issues raised that the film should speak to a wide audience. Watching the film I knew I was seeing something more universal, and that I shouldn't be forced to see it through one prism. For that reason I want to see the film again and see it on it's own stand alone terms and not one imposed by the NewFest write up.